Change.org PETITION: Stop Forced Evictions of Haiti's Earthquake Victims - signed by Action�Aid Haiti, Bagay Dwol Haiti Relief Fund, Canada Haiti Action Net�work, Cen�tre Med�ical Social Port au Prince, Kon�bit pou Ayiti (KONPAY), Hait�ian Amer�i�can Orga�ni�za�tion for Social & Eco�nomic Devel�op�ment (HAOSED), Health Empow�er�ing Human�ity, Honor and Respect Foun�da�tion, Human Rights Accom�pa�ni�ment In Haiti, Insti�tute for Jus�tice & Democ�racy in Haiti, Inter�na�tional Action Ties, Lambi Fund, Men�non�ite Cen�tral Com�mit�tee U.S. Wash�ing�ton Office, Part�ners in Health (PIH), People�s Health Movement-USA, Quixote Cen�ter, Sus�tain�able Organic Inte�grated Liveli�hoods (SOIL), TransAfrica Forum, UnityAy�iti: Boston Sol�i�dar�ity with Haiti, World Ser�vice of Mercy, You. Me. We.
" The Hait�ian Gov�ern�ment and pri�vate landown�ers have evicted thou�sands of res�i�dents from these encamp�ments with�out a viable alter�na�tive for their relo�ca�tion, and in some cases with no alter�na�tive at all. The UN and Hait�ian Gov�ern�ment agreed on April 22 to an imme�di�ate 3-week mora�to�rium on forced evic�tions which expired, Thurs�day, May 13th. Within that period reports of evic�tions con�tin�ued. Human�i�tar�ian aid, includ�ing food, water and san�i�ta�tion facil�i�ties have been cut off in tar�geted camps (1, 2). In other loca�tions, res�i�dents are being harassed and abused by the police. The peo�ple most affected by the earth�quake, those who have lost their fam�i�lies, homes and liveli�hoods, now live in fear that they may be vio�lently forced to leave their present set�tle�ments with�out viable options estab�lished for relo�ca�tion (2). These actions are pro�hib�ited under the UN�s Guid�ing Prin�ci�ples on Inter�nal Dis�place�ment. The UN Prin�ci�ples, which are based upon inter�na�tional human�i�tar�ian law and human rights instru�ments, estab�lish the frame�work for pro�tect�ing the rights of dis�placed peo�ple, includ�ing the right to basic ser�vices (food, water, shel�ter, edu�ca�tion, med�ical ser�vices, and san�i�ta�tion) and to be pro�tected from vio�lence (4). When these rights are not upheld, UN agen�cies are oblig�ated to call on rel�e�vant par�ties to respect them (5). Specif�i�cally, the OCHA CCCM Cluster-designated Camp Coor�di�na�tor is charged with devel�op�ing an �exit/transition strat�egy for camp clo�sures while ensur�ing that responses are in line with � stan�dards includ�ing rel�e�vant gov�ern�ment, human rights, and legal oblig�a�tions� "
According to PROFESSOR MARK SCHULLER who has JUST RETURNED FROM spending his summer STUDYING AID DELIVERY and the LIVING CONDITIONS IN THE CAMPS & who is AMY GOODMAN's GUEST ON the posted DN! VIDEO program, EVICTION IS AGAIN A VERY REAL THREAT! It�s been over seven months since Haiti�s devastating earthquake left up to 300,000 dead and displaced over 1.5 million. Only a small fraction of the displaced have found new homes, and those who�ve found shelter in temporary camps now face a new round of displacement. According to Haitian community groups, thousands of Haitians are at risk of forcible eviction from some of the 1,300 camps established since the quake. The evictions come at a time when reports show a rising number of rapes and sexual abuse in the aftermath of the quake, especially in the camps for the internally displaced. The discussion is full of information you'll hear only on DN! 1) "According to the UN-sponsored Haiti Reconstruction Fund, only TWO COUNTRIES�Brazil and Estonia�have paid the FULLY PLEDGED amount. The United States, France, Canada and many other countries have FAILED to send their PLEDGED AID. 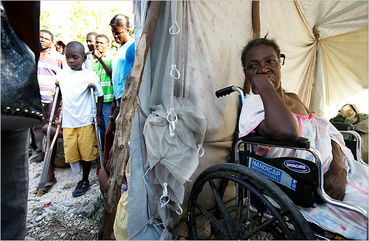 A recent review by CNN found that just TWO PERCENT of total pledges have been delivered to Haiti." - AND YET WE STILL HEAR PEOPLE EXPRESSING DISAPPROVAL - WHERE HAS ALL THAT AID MONEY VANISHED TO? WHY AREN'T THE HAITIANS GETTING THEIR RECONSTRUCTION BETTER OFF THE GROUND? 2) SCHULLER says: "Well, about 65 percent of the camps are owned by private landowners. And, you know, it�s been several months, and the government has no funds, as you know, to do any kind of�you know, to reimburse the landowners, and there�s no public will for such. So, about 20 percent of the camps have been closed between May and July. And I�ve been working with eight student assistants, and they discovered about another eight percent of camps that are either being shut down or under threat of being shut down." Listen to SEAN PENN, as well as PROFESSOR SCHULLER, to get a handle of what is really happening on the ground. Also: France Urged to Pay $40 Billion to Haiti in Reparations for "Independence Debt" According to the UN-sponsored Haiti Reconstruction Fund, only two countries�Brazil and Estonia�have fully paid the pledged amount. The United States, France, Canada and many others have failed to send their pledged aid. A recent review by CNN found that just two percent of total pledges have been delivered to Haiti. Calls are now growing for another form of payment to Haiti: REPARATIONS. This week, a group of prominent ACADEMICS AND ACTIVISTS published an OPEN LETTER calling on France to repay an "independence debt" it imposed nearly 200 years ago after Haiti successfully won independence from France. Haiti was forced to pay France around 90MILLION GOLD FRANCES up until World War II, which after interest and inflation is VALUED TODAY AT up to $40 BILLION. Both of Amy's guests on this program, Vox Sambou, Montreal-based Haitian hip-hop artist (his website is VoxSambou.com) & Jean Saint-Vil, Ottawa-based Haitian writer and activist (website is GodIsNotWhite.com) have important things to tell us about Haiti before & since the devastating earthquake. to take all appro�pri�ate mea�sures to pre�vent another human tragedy in Haiti: We call for an imme�di�ate stop to forced evic�tions and the devel�op�ment of a human rights mon�i�tor�ing sys�tem to ensure that fur�ther vio�lence and vio�la�tions do not take place. A trans�par�ent process to relo�cate camp inhab�i�tants that is rights-based and pro�tects earth�quake vic�tims is essen�tial for national recov�ery to occur in a man�ner that pro�motes dig�nity and is sen�si�tive to the needs expressed by the com�mu�ni�ties. 1. An expan�sion of cov�er�age and time exten�sion for the mora�to�rium on forced removals: Evic�tions and/or invol�un�tary removals from all camp set�tle�ments must be offi�cially sus�pended for an addi�tional 90 days to allow alter�na�tive options to be explored and agreed upon. 2. An inde�pen�dent mon�i�tor�ing sys�tem: The OCHA Pro�tec�tion Clus�ter, MINUSTAH Human Rights Sec�tion and all other stake�hold�ers for human rights, includ�ing Hait�ian civil soci�ety, must imme�di�ately develop a col�lab�o�ra�tive sys�tem of inde�pen�dent mon�i�tors in loca�tions where IDPs face removal from their com�mu�ni�ties, both vol�un�tary and forced, to address com�plaints from dis�placed persons. 3. Gen�uine com�mu�nity con�sul�ta�tion: Com�mu�nity rep�re�sen�ta�tives and civil soci�ety, espe�cially women and the youth, must be included in all plan�ning processes, pro�mot�ing culturally-relevant solu�tions with respect and sup�port for self-determination. No viable or just solu�tions to the com�plex issue of reset�tle�ment can be deter�mined with�out dia�logue between those most affected and those upon whom it is incum�bent to pro�tect the rights of the Inter�nally Dis�placed Person. Thanks so much for posting this, Jill. Just because the situation in Haiti has pretty much faded from the mainstream media does NOT mean the situation is no longer in dire need of reparation. We cannot allow our emotions and commitment to humanity to be controlled by headlines! Thanks, just one more thing that still continues but has lost the interest of the press. Guess the Mosque in NYC is far more important then the dire needs of these people. Petition signed...Thanks for posting for our awareness, and thanks Carole for alerting me to this needed petition. I saw this show & am aghast at the lack of common decency under the circumstances ! Thanks for posting, dear Jill. My thanks too to Jill, the "peasant Diva" and Carol, signed of course. Had no idea the situation there was THAT AWFUL, my God. What a shame all those countries-including yours and I guess mine, too- have not yet sent their pledged aid after all this time. Thank you peasantDiva. Signed, noted and shared. by keeping them in constant fear and uncertainty. Sounds familiar doesn't it. and still makes the people drink from puddles on the road.
" don't send blankets, clothing or food, JUST SEND MONEY ". of several unsuspecting pawns to help getter go'in. Some of these pawns also go by the name of movie stars. What a money bonanza for someone- where did all those millions really go.? to come in and help clean up the problem. more like they kept 98% of the pledges cause the people aren't getting it. How much did Chelsy's wedding cost BTW ? around $5 million dollars ? Bill is supposed to be an EX president of the Corporation collecting unemployment checks. When I first saw this video (uploaded to YouTube in April 2010), I was in shock . . . NOW, I'm FURIOUS! My god, Carole ! That video is really distressing. Kudos to the author, for show just how pathetic the Red Cross is. Have they no shame? I would like to get a look at some bonafide Red Cross emergency housing, if any actually does exist. I've read that there are hundreds of refugee camps. Did the Red Cross equip ANY of them? I'd also like to see if there is another petition somewhere or another means of taking action. It's 1:20 AM here, so I'm afraid I'll have to put my curiosity on hold & my head on my pillow...for now. Haiti six months later: Where's the money? "But there's another huge category of money, and that's where you probably fall in: charitable donations like the Red Cross, UNICEF, Doctors Without Borders. These organizations have received $1.3 billion. "The best count anyone has is over 930 organizations inside of Haiti responding to the disaster," said Saundra Schimmelpfennig, founding director of The Charity Rater. "Imagine attempting to coordinate 930 different organizations." Schimmelpfennig is an expert on non-profits and understand the complications. She says the situation in Haiti is extremely complicated. Take, for instance, the reason aid groups are no longer giving food to the hungry. It's because the Haitian government asked them to stop. "The reason for this is if you import a lot of food and you give it away for free you put a lot of people out of work," said Schimmelpfennig. "You put the food importers, you put the distribution, you put the shopkeepers out of work and pretty soon you've got a lot more people who are now desperate for aid as well." Haiti's unemployment rate is around 90 percent. How do get money to buy food? While some organizations like Doctors Without Borders have spent almost every penny donated to help Haitians, other organizations like the Red Cross haven't even spent half. "We're talking about spending roughly $200 million over the next year in areas like transitional housing," said said Paul Schulz, chief executive officer of The American Red Cross of Greater Los Angeles. "So we're lining up the material and the labor. Now what we need is the proper land from the government to start building." Land may be the biggest reason for this humanitarian catastrophe. Only a handful of rich families own most of the land in Haiti. They don't want indigent people living on it. And so far the Haitian government has not come up with a solution. As a result, one and a half million people are trapped in transitional camps and continue to suffer. Another infuriating fact: There are warehouses filled with food, goods and medical supplies already in Haiti. A lot of it arrived in January, right after the quake, but because of the lack of coordination between the relief organizations and the government, it's just sitting there. That blunder is costing lives." Thanks Just C, that is one of the clips I was referencing. I seen that a while back and really started to think and wonder. Wonder just how stupid they think we are. This goes to show how corrupt the system really is and who moves on to the "questionable list". these people basic food and water. and they didn't even feel it on the other side of the same island. are felt hundreds of miles away. Hmmmmm interesting !!! operation usa is one of the best charities i know of. check out charity navigator. i have also given to yele.org because nobody cares about haiti like wyclef jean. I recommend Doctors without Borders. What a terrible situation. United Nations personnell ignoring rapes, the government of Haiti putting up reasons that food aid should not be distributed to the hungry, shelter being ripped up by police, people being forced to leave refugee camps with nowhere to go, publicity hungry governments satisfied they have gained their good publicity by promising aid money but not actually giving it, and the donations of millions falling into a black hole. End result - more and more death and suffering. I'm a member of CHANGE.ORG and already signed this. It's terrible, after all they have been though there. Thank you for signing the petition "Stop Forced Evictions of Haiti's Earthquake Victims"
It does not matter where one lives today, if you are poor, have little or no resources available to you, your used, abused, neglected, and forgotten. Major world Governments around the World can not straigten this mess out, because they are too busy trying to f....with everyone, so many depend on Aid jobs to be their jobs and little of the money getting to the people, we have red taped our way into hell, backed up by those who like it that way because no one can lay a finger on who is running away with the money. A disgrace upon EVERYONE in this World, to allow others to suffer so after all these months. Now we have the floods of Pakistan and they too who are poor will join the ranks of suffering. The news of the USA is more concerned about what the Presidents wife ate or wore in Spain the took hours to discuss about that trip and pick it apart, meanwhile we have things like this happening around the world, with little to no coverage. I feel Shame at having to call myself a Human, I think I'd rather be a cat, horse, or a penguin. Animals take better care of their own than we do as a Human race. What! That's outrageous! This mustn't happen! Signed earlier, TY PeasantDi and for the fw "C". Noted . Petition sincerely signed. Thanks Peasant for the post.Thanks Carol for drawing my attention to it. Like Ellen W., I, too, recommend Doctors without Borders. When I first heard of the earthquake in Haiti, I went straight off to my local Medecins sans Fronti�res (Doctors without Borders in French) office to make a donation. They were present in Haiti even before the earthquake, but afterwards, with all the complicated fractures, they were essential. THEY DO THEIR JOB! And SERIOUSLY! Noted and signed, thank you for sharing!!! How do you evict someone from a tent?!!! I am so,so disgusted with what's going on in this world!!!! Why are we doing this to each other?!!! My heart aches!!! Thanks Peasant Diva and Just Carol for the alert! Signed change.org! Bill Clinton, special UN envoy to Haiti, is charged with overseeing the aid and has vowed to accelerate the process. How about Bill Clinton and Dubya open the books to see how much came in and where it went. Trust those two if you want- I don't have to. Noted and signed , thanks ! !